Syria's political system is dominated by the coalition of the National Progressive Front, which is led by the Ba'ath Party. Within that coalition are a number of smaller parties such as the Arab Socialist Movement. On 30 January 2019, I conducted an interview with the Damascus branch of the Arab Socialist Movement. Any parenthetical insertions in square brackets are my own. Emblem of the Arab Socialist Movement. Q: When was the movement established and what were the reasons for its establishment? A: This movement is considered an evolution of the Arab Socialist Party that was established by Othman al-Hawrani in 1936 under the name of the Youth Party and its name subsequently became in the 1950s the Arab Socialist Party. Then its leadership passed to the Syrian politician Akram al-Hawrani after that. Akram al-Hawrani had joined the Syrian Nationalist Party in 1932, and withdrew from it in 1937 in order to join the Youth (Arab Socialist) Party. And at the end of 1952 the Arab Socialist Party merged with the Ba'ath Party, in order for the Arab Socialist Ba'ath Party to be established. And after the separation from the unity between Syria and Egypt and the return of the parties, the Arab Socialist Party returned to pursue its struggle until the National Progressive Front was established, for it was one of the five founding parties and its name at the time became the Arab Socialist Movement. And when the prior secretary general for the movement Abd al-Ghani Qanot died in March 2001, the deceased comrade Ahmad al-Ahmad was elected as secretary general for the movement in the seventh general conference and as a member of the central leadership for the National Progressive Front until his death on 25 August 2016 and on 24 May 2017 the comrade the engineer Omar Adnan al-Alawi was elected secretary general for the Arab Socialist Movement party in the eighth general conference in elections that were held under the oversight and supervision of the committee of the affairs of the parties. Omar al-Alawi as head of the Deir az-Zor centre of the National Defence Forces. Q: What is the manhaj [program/ideological direction etc.] of the movement and how does it differ from the manhaj of the Arab Socialist Ba'ath Party? A: Its manhaj is the same as the Ba'ath: Unity, Freedom, Socialism. One Arab Ummah: bearing an eternal message. Q: Yes, but why doesn't the movement merge into the Ba'ath Party? I mean officially. A; It is not allowed. We work under the banner of the National Progressive Front, and the Ba'ath leads it. And the President is the head of the Front. Q: What has been the role of the movement in defending Syria since the beginning of the events? A: Since the beginning of the events the imperialist plan was clear to the movement, and [it was clear] that the aggression was targeting the homeland in all its components. Thus the movement was honoured to participate in defending the homeland by participating in national demonstrations and spreading patriotic and Arab nationalist awareness and combating destructive, oppressive ideas. 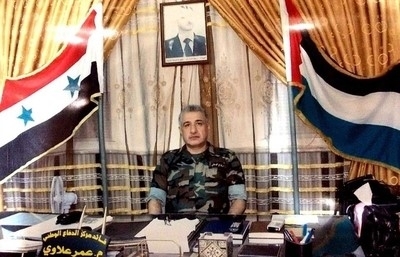 And after the development of the events towards destroying the homeland through armed work financed from abroad, the comrade engineer Omar al-Alawi (the current secretary general for the movement) was appointed commander for the National Defence [Forces] in Deir az-Zor and during the darkest circumstances from the siege of the town. At that time al-Alawi was assistant secretary general of the movement. al-Alawi was wounded in the battles such that they left permanent impacts for him, among them in his eyes. This required for him to be treated in Damascus and during his presence in Damascus he established an auxiliary force for our intrepid army under the name of Quwat Muqatili al-Asha'ir and that was in cooperation and joint work with the companion Dr. Turki Albuhamad, the commander of these forces currently. And most of the affiliation to it has been from comrades in the movement. 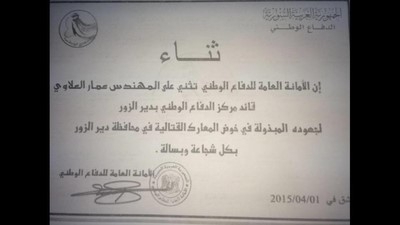 Commendation from the National Defence Forces' General Secretariat to Omar [Ammar] al-Alawi. And these forces have participated in the expulsion of terrorism from our sacred land in every place in which terrorism is found, and they have done well and obtained a number of honours and commendations. And that was under the command of our intrepid army. Note that this auxiliary force has offered more than 1260 martyrs. Q: Does the movement have a youth wing? A: The movement has a youth wing, working on all national occasions, among them cleaning the Barada river and participating in Luqmat Sa'im and also national demonstrations. Activities of the Arab Socialist Movement. 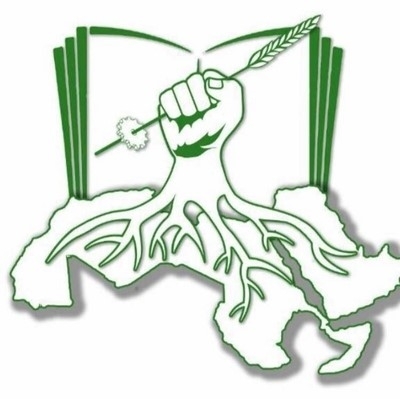 Q: The movement has branches in all the provinces of Syria? A: Yes in all the Syrian and Lebanese provinces. Q: You don't have a presence outside Syria and Lebanon? A: Syria and Lebanon only. The Arab Socialist Movement has a presence in Lebanon as well as Syria. 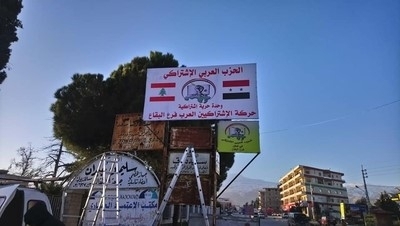 The signboard is for the party's Beqaa branch in Lebanon. Q: Lastly, how do you assess the general situation in Syria today? A: Strategically, terrorism has been defeated and America has decided to depart and has not considered Iran's departure to be a condition for that because it [America] has been defeated and Syria is completing the tactical steps regarding the presence of the last pockets of terrorism. And the time has begun for work towards reconstruction and investing in the great internal resources from oil to phosphate and many other things and the world's direction will be towards investment. The believing Arab people have been steadfast in their Arab nationalism and their wise, strong historical leadership headed by the president, this unique Arab nationalist leader who has been victorious over the Arabs through Arab nationalism and has been victorious over imperialism through force and determination and wisdom and faith. 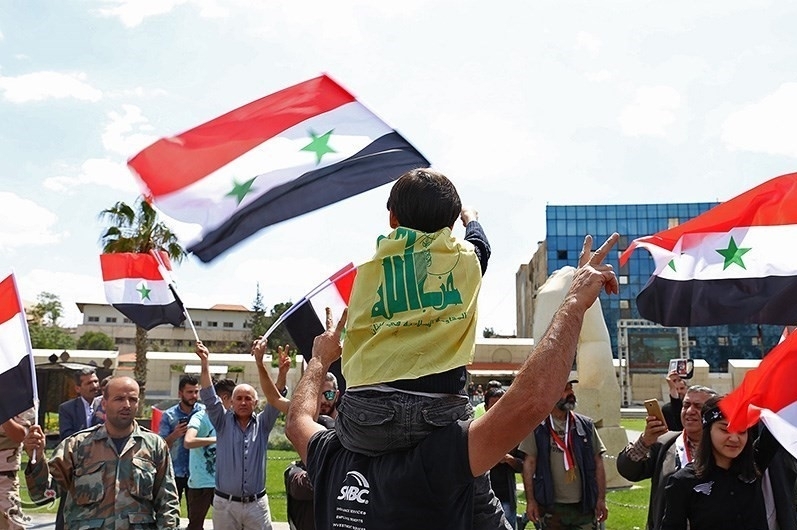 Syria considers this battle of hers to be a step on the path to liberating al-Quds [Jerusalem] and all the usurped Arab land, beginning from the words of the president that Arab nationalism is the jewel of citizenship and its destination will remain noble al-Quds. Our bet in Assad's Syria is always on the Arab people who will rise up in the face of the backward, rotten, ruling Khaliji [Gulf Arab] clique and whoso is on their Wahhabist Ikhwani path that has adopted the religion as a commodity.